The development of e-services in Estonia has been fast in recent years. Most management of business with the state can be executed either by e-mail or through different portals. Simpler proceedings can be performed by way of summary procedures, but more complex transactions requiring legal certainty must be confirmed either with personal or notary�s digital signature. The development of e-services in Estonia has been facilitated by the wide spread of the Estonian ID card and broad availability of the Internet. The ID card allows us to securely communicate with the state. Can the same be said about communication with other EU member states? Estonia has set itself a target to accept digital signatures that have been issued with ID card certificates of other EU countries. Portugal has a similar aim and other countries are also moving in the same direction. Most Estonians know that they can communicate with the state without leaving home and confirm transactions by digital signature, if necessary. Though the number of people using this possibility is still limited, the usage is expected to gradually increase. Enterprises operating in Estonia must communicate with the state frequently. Paying taxes and submitting annual reports constitute a yearly activity for businessmen. Foreigners willing to do business in Estonia usually establish a company here. 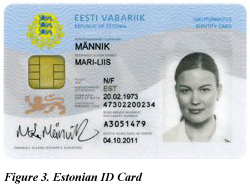 Owners of the Estonian ID card can establish a new company easily and conveniently over the Internet, but up to 2008, this was not possible for foreigners. 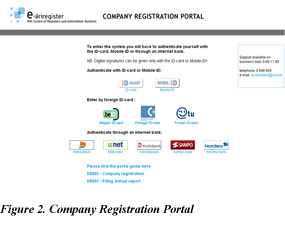 Since November 2008, the Company Registration Portal is open also for ID card owners in Portugal, Finland, Belgium and Lithuania, allowing them to set up a company in Estonia through the Internet. This cross-border digital signature project, led by the Ministry of Justice and the Centre of Registers and Information Systems (RIK), is probably the first, where a register of one country officially accepts the national ID cards (certificates) and digital signatures issued with them of other countries. The project was launched in 2007 in co-operation with the Portuguese business portal Portal da Empresa, managed by the Ministry of Justice of Portugal, which now accepts also the Estonian ID card and digital signature. Similarly to the Estonian Company Registration Portal, the Portuguese business portal allows, in addition to the establishment of a company, submitting annual reports and amending registry details of a company. 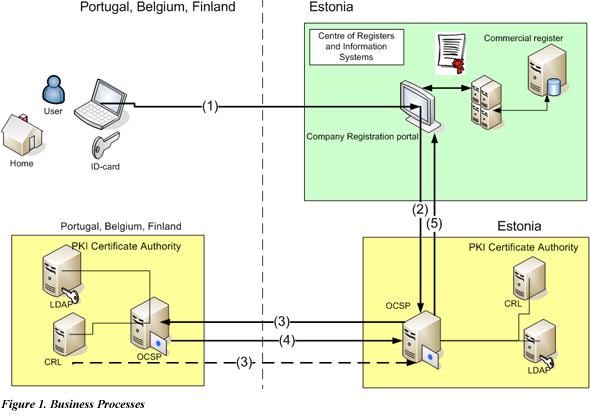 There are electronic proceeding portals or plans to develop these in most EU member states, but the Estonian Company Registration Portal and its Portuguese counterpart are, to our knowledge, the only portals in Europe enabling electronic authentication and digital signatures by ID card owners of other countries. Electronic proceeding considerably reduces administrative burden and facilitates the life of businessmen. For instance in 2008, 40% of private limited companies were established and 20% of annual reports were submitted through the Estonian Company Registration Portal. The percentages have doubled every year and, hopefully, the Company Registration Portal will become as popular among foreign businessmen as it is among domestic ones. Why is the recognition of foreign digital signature certificates necessary? 1) According to the decision of the chief processor of the register, the foreign certification service provider complies with the requirements provided in the Digital Signatures Act and legislation established based on the basis thereof. 2) The certificates of the foreign certification provider are guaranteed by a certification service provider acting on the basis of the Digital Signatures Act, who assumes responsibility for the accuracy of the data contained in the certificates. 3) The certificates issued by the foreign certification provider are recognised by an international agreement entered into by the Republic of Estonia. At the same time, there is currently no fully functional system for the evaluation of foreign digital signature certificates and for the check-up of their validity. Therefore, it is not yet possible to accept digital signatures on a wider scale (the conditions of issuing digital signature certificates by certification service providers in different countries vary considerably). For the time being, the Ministry of Economic Affairs and Communications has given positive assessment to the qualified digital certificates issued in Portugal, Belgium and Finland as well as to their accordance to our Digital Signatures Act. In order to allow foreigners to manage their affairs in Estonia without having to come here, a system should be developed for the evaluation and check-up of digital signature certificates issued in other countries. Documents that have been digitally signed by recognized certificates could be used in different fields. First and foremost, they could be used in legal proceedings, registry matters and administrative proceedings, but also in relations under civil law. Bank transaction can be brought out as an example of the use of digital signatures in private law. In legal proceedings, a system for the evaluation of certificates issued abroad would allow citizens of other member states submit applications to Estonian courts electronically and enable, thus, to extend the application area of order of payment order set out in the Regulation (EC) No 1896/2006 of the European Parliament and of the Council.